Home > Ministry of Rural Development > Government is committed to strengthen MGNREGA, says Jaitley. 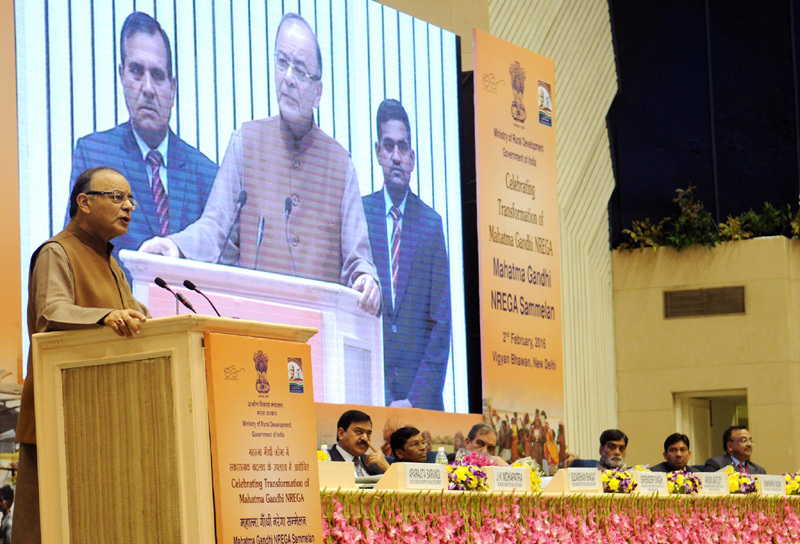 Government is committed to strengthen MGNREGA, says Jaitley. Rural job scheme witnessed a record fund allocation of Rs 37,000 crore. The Finance Minister Shri Arun Jaitley today said that the Government is committed to strengthen the rural jobs scheme MGNREGA and it has allocated Rs 37,000 crore this fiscal, which is the highest ever budgetary support to the scheme. Addressing a MGNREGA Sammelan, organised to mark the completion of 10 years of the scheme, he said, government will boost the public spending in other rural sectors also like road, electrification, health, education and irrigation to spur the growth as private sector is not contributing to it as desired. Allaying the apprehensions in some quarters that MGNREGA will be scrapped or will be replaced with some other scheme, Shri Jaitley said, in coming years more funds will be provided to rural jobs scheme as this is basically a demand driven programme. The Finance Minister also underlined that this is the first year, where resources allocated in the budget for MGNREGA or other social sector schemes will not see any cut, as was the practice for the past several years to prune the planned expenditure affecting development. 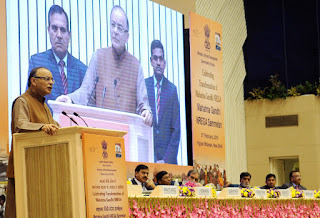 Shri Jaitley said in the wake slowdown in global economy, India has to boost the public spending in rural sectors to economically empower the people to achieve higher growth targets. In his address, the Minister for Rural Development, Shri Birender Singh said that 2015-16 has seen a revival of the MGNREGA programme due to a slew of reforms undertaken by the Ministry of Rural Development. The personday generation is the highest in the second quarter (45.88 crore) and third quarter (46.10 crore) than it has been in the last five years. Shri Singh also informed that more than 64% of total expenditure was on agriculture and allied activities and 57% of all workers were women, well above the statutory requirement of 33%, the highest in three years. The Minister said, among the reforms responsible for revival of MGNREGA are the timely release of funds to states to provide work on demand, an electronic fund management system, consistent coordination between banks and post offices besides monitoring of pendency of payments. The Minister said that from 1st April, 2016 all wage payments to MGNREGA workers will be done through Direct Benefit Transfer. Currently, 94 percent of the wage payments are directly deposited in the account of beneficiaries Shri Singh said his Ministry has also reacted swiftly to the distress situation of droughts in nine states by declaring an additional 50 days of employment in the drought affected areas, he added. The Minister of State for Rural Development Shri Sudarshan Bhagat said that since the start of the programme, the expenditure on the programme has amounted to Rs. 3,13,844.55 crore and out of this 71% has been spent on wage payments to workers.. He said, the focus for the upcoming years will be on simplification and strengthening of procedures and a Master Circular is being issued today which consolidates all key instructions from the Central Government on the implementation of the Act. Shri Bhagat said, the Ministry will also aim to train and place 10,000 Barefoot Technicians from worker households and through Project LIFE, skill and train workers for wages, for self-employment and livelihood upgradation.